Prior to his appointment as Permanent representative of Senegal to the United Nations, Mr. Diallo served as Ambassador and Diplomatic Counsellor to the Prime Minister, a position he had held since 2002. From 1998 to 2001, he was the Deputy Director of International Organizations in the Ministry for Foreign Affairs, with prior experience as Counsellor in the Permanent Mission of Senegal in Addis-Ababa, Ethiopia, from 1992 to 1998, and as Chief of the United Nations Division in the Ministry for Foreign Affairs, from 1990 to 1992. Mr. Diallo has represented the Senegalese Government at various international forums, including the United Nations General Assembly, from 1999 to 2009. He was a member of the Senegalese delegation to several sessions of the Human Rights Commission and the 2002 session of the Committee on the Elimination of Racial Discrimination. 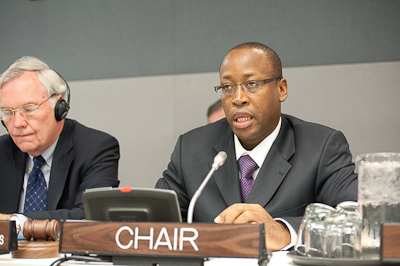 In the area of disarmament, Mr. Diallo served as his delegation’s Rapporteur for the first three Conferences of Parties to the Convention on the Prohibition of the Use, Stockpiling, Production and Transfer of Anti-Personnel Mines and on Their Destruction, in Maputo, Mozambique (1999); Geneva, Switzerland (2000); and Managua, Nicaragua (2001). Mr. Diallo has also represented the Government of Senegal at conferences of the African Union, Economic Commission for Africa, and United Nations Human Settlements Programme (UN-Habitat), as well as at the twelfth (2005) and thirteenth (2006) Conference of States Parties to the United Nations Convention on the Law of the Sea, held in Kingston, Jamaica. 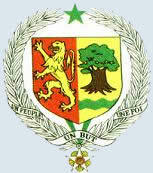 Mr. Diallo completed studies at the Ecole Nationale d’Administration et de Magistrature in 1989. Mr. Diallo received a Masters degree in law, with a focus on public law, from Cheikh Anta Diop University, Senegal, in 1987. Born in Koungheul, Senegal on 19 August 1963, Mr. Diallo is married with two children. J’ai le grand plaisir de vous souhaiter la cordiale bienvenue à ce site web de la Mission permanente du Sénégal auprès des Nations Unies à New York. Héritier d’une riche histoire politique, mon Pays, qui se situe à la pointe occidentale du Continent africain, s’est distingué, depuis son accession à la souveraineté internationale, par ses multiples initiatives en faveur d’une plus grande cohésion de la communauté internationale, en militant pour la construction d’un monde de paix, de solidarité et de prospérité. Tout en restant attentif à vos suggestions et conseils, je nourris l’espoir que les informations y contenues vous seront utiles et vous permettront de mieux mesurer le sens du combat diplomatique qui a toujours animé le Sénégal.